Will all the excitement over babies this week (the Royals and the Fallons), you might want to sneak a peak at some of the most perfect infant shoes ever, on display at the Met’s micro-exhibit, Objects from the Kharga Oasis, right under the grand staircase just past security until August 4. 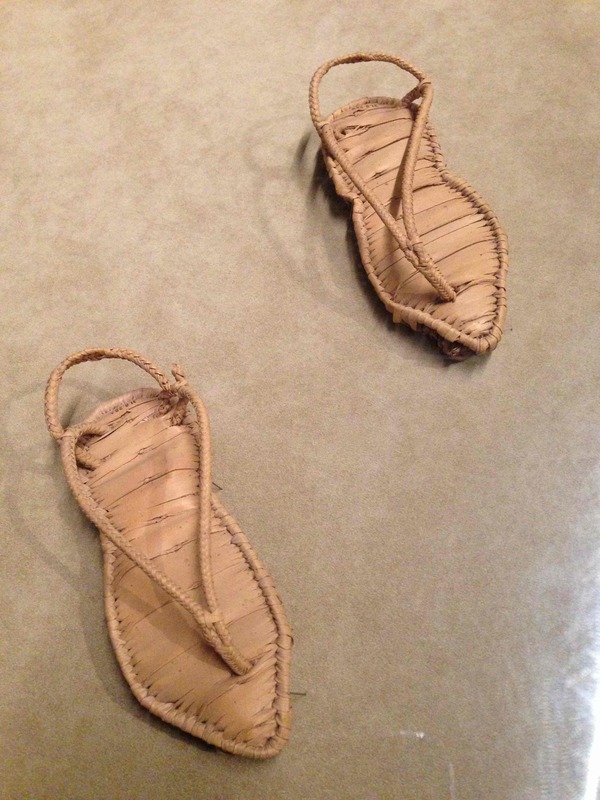 Back in the 1930s, Metropolitan Museum archaeologists found this pair of infant sandals crafted beautifully from palm leaves at an oasis in the western Egyptian desert that was one of the earliest frontier Christian communities serving the trans-Saharan caravan routes. The shoes are tiny – only about 2 x 5 inches – and were made during the Coptic (Byzantine) era sometime between 300 AD and 600 AD. There are also 1,500 year-old linen tunics and caps for kids and adults nearby, too. It’s amazing that the clothing survived at all. Besides building churches (and there are plenty of photos and illustrations in the show), the communities around Kharga were busy growing grains, sesame, olives, and grapes. They apparently had a huge business making and exporting wine to the thirsty Egyptians 150 miles east along the Nile and 400 miles northeast in Cairo. Drawing upon a ceramic craft tradition that was happening at the oasis since Old Kingdom times (2600 BC), potters cranked out transport jugs for the vino (shown here) and decorated them with grapevine paintings. The show has jewelry, tombstones, and photos of early Christian churches, but the brand-new-looking baby shoes are really the stars of the show. 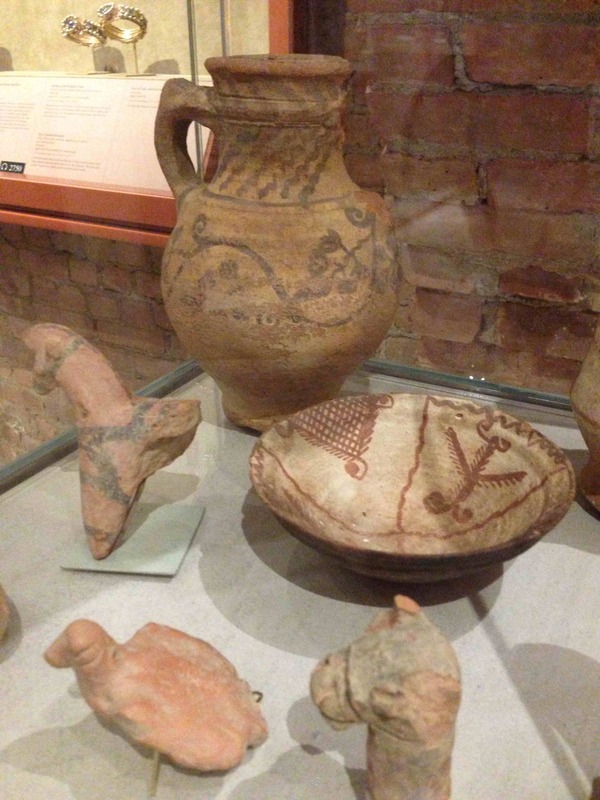 Among dozens of ceramic items dug up by the Met are grapevine-decorated earthenware jugs to transport locally made wine from the Oasis to the Nile and upriver to Cairo. 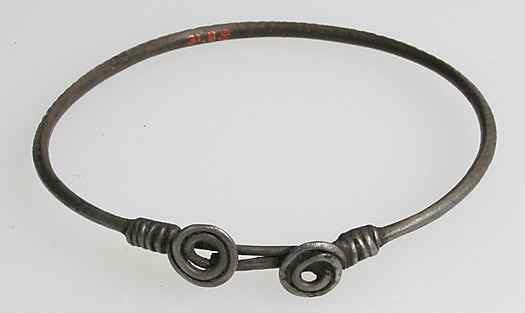 This entry was posted in Art, Fashion, History, Museums and tagged arts, culture, fashion, history, museums, style, textiles by mssusanb. Bookmark the permalink. How can I possibly keep up with all the AMAZING things you keep finding on your wanderings!!!! !